My 1962 Hammond M-111 tonewheel organ, which uses additive synthesis to produce the "Hammond Sound". Why does the Hammond tonewheel organ (or a good clonewheel) sound like no other electronic organ? What exactly is it that constitutes the “Hammond Sound”? Many will say that it is the Leslie speaker, with its unsynchronized counter-rotating treble and bass drivers, that produces the sound associated with the Hammond organ. That is probably true to a great extent, since most jazz and gospel music recordings and live performances are done with a Leslie speaker, or a good emulation thereof. A Leslie certainly makes the Hammond sound come alive, and it can do the same for other organs (and even other instruments). Yet even with no Leslie and no other form of modulation (e.g. Hammond’s unique approach to vibrato), the sound of a Hammond organ is still unmistakable. But why? I think it is the tonal simplicity and purity of Hammond’s additive synthesis mechanism. Leaving modern digital organs (which either play back samples or mathematically emulate older instruments) out of the picture, electronic organs fall into two broad categories: subtractive and additive synthesis. 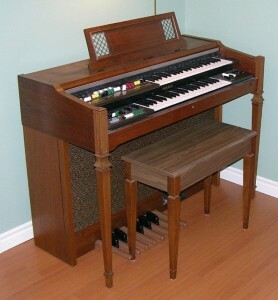 My 1970s Yamaha BK20, a typical analog subtractive synthesis organ. In subtractive synthesis, the sound of an organ stop is derived by starting with a waveform rich in harmonics (for example, a sawtooth wave), and then applying carefully (or not so carefully) designed tone filters to alter the relative intensities thereof. Often, the goal is to reproduce the harmonic distribution of a physical instrument such as a clarinet, violin, or a particular kind of pipe in a pipe organ. Organs using additive synthesis let the musician use drawbars to combine harmonics in varying amounts to produce a complex tone. Technically, each harmonic should be a pure sine wave (the only inherently non-complex tone), and in the Hammond this is very close to true. Some drawbar organs, such as the Vox Continental, produce harmonics that are themselves complex tones instead of true harmonics, so the effect is more like that of combining stops on a subtractive organ. In theory, both subtractive and additive synthesis can produce the same result. In the former, one starts with everything and takes things away until one is left with the desired sound. In the latter, one starts with nothing and adds things to achieve the desired result. In practice, it’s not feasible to achieve the same results with both methods, and that is the crux of the Hammond sound. A Hammond organ has nine drawbars per set. One of these is the fundamental (1st harmonic), two are sub-harmonics (tones below the fundamental), and six are harmonics. The available harmonics are the 1st, 2nd, 3rd, 4th, 5th, 6th, and 8th. Because all of the harmonics come from the same tonewheels that generate the fundamental of higher notes, not all of the frequencies are exactly right. Only the 2nd, 4th, and 8th are, while the rest are very slightly sharp or flat. The 7th harmonic is missing because there are no frequencies in the tonewheel generator that are close enough to be used as such. Because of this limited set of harmonics, the resulting sound will be very simple compared to the sounds produced by most physical instruments. The original image on the left represents a complex tone containing all harmonics. The image in the centre seen through a rose-coloured filter represents subtractive synthesis. The rightmost image attempts to duplicate this by combining a limited number of shades of red. Subtractive synthesis as used in many other organs usually starts with tones containing all harmonics. So, in addition to the harmonics available on the Hammond, the 7th, 9th, 10th, 11th, and so on are all there. Electronic filtering is used to suppress some of these harmonics to varying degrees. If the filters were both sufficiently precise and absolute, it would be possible to completely eliminate the 7th, 9th, etc., producing a sound almost exactly like that of a Hammond organ. But filters are not that precise or absolute, nor are the designers of subtractive organs trying to emulate a Hammond, so the result is likely to sound more like something that could be produced in the physical world. That, in my opinion, is what makes a Hammond organ sound the way it does. The Hammond sound is, quite literally, unreal. I’m not a great musician, nor am I a musical or auditory psychologist, so I’m going out on a limb here, but perhaps it is this simplicity of sound that lets the music come through more clearly. This is very much the way I felt the first time I heard Wendy Carlos’ Switched On Bach. That recording allowed me to appreciate the intricacies of the music, instead of losing it in the organized muddle that is an orchestra in a concert hall. I don’t know when you wrote this. 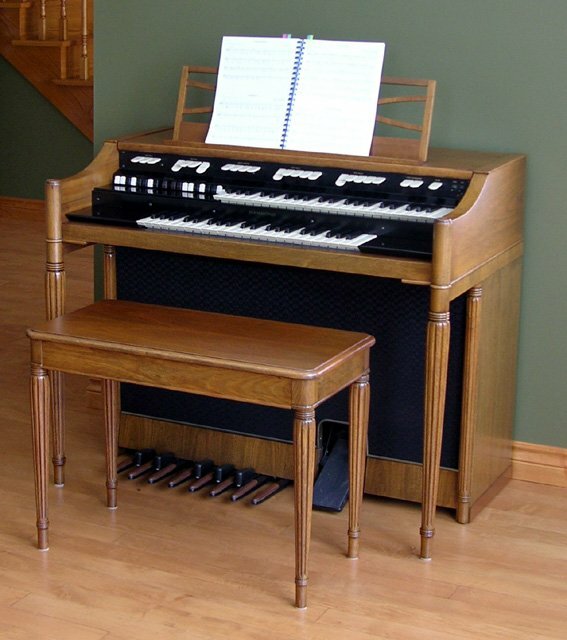 I’m searching info about Yamaha BK20C organs, how good are these Yamaha organs for jazz and rock, the rotary speaker and percusive attack, are relly good? I’ve seen videos but people plays slowly and nice quiet sound, I’m looking for agresive settings, BK20C can? Sorry for my English, I write better in spanish. Well Daniel, I’m not much of a musician, so I can’t really give a very informed opinion on how good they are for this. The rotary speaker _is_ better than a simulation, but unlike a real Hammond, there’s only a single rotating mid-range-to-treble horn, instead of separate rotating treble and bass horns. The horn also rotates around the horizontal axis instead of the vertical axis, so it doesn’t have that room filling sound. The percussive attack is pretty good from what I remember. One thing to consider is that the 70s Yamaha combo organs were based on the same technology and circuits as the home organs, and those combo organs were quite highly regarded. I came upon your article quite by accident, and thought I might add a thought or two. I am pleased to hear that there is still some interest in electronic organs in the current generation and some appreciation of what used to be. The distictive sound of a Hammond comes largely from the substitution of other notes for the harmonics that are found in more “natural” instruments. For example, on a Hammond if you add some of a higher G to C it only approximates the harmonic of C that is close to G. Pianos and other keyboard instruments have their temperment set by adjusting a note while listening to the “roll” or beat between a harmonic and the note that approximates that harmonic. In the Hammond there is no “roll” so you get a synthetic sound. As you point out, the rotating speaker ( usually a Leslie) masks this and for many people improves the sound. Pipe organs often include harmonics provided by another rank of pipes to provide a strong harmonic (Quint, Tierce, etc.) These are normally tuned to provide the correct frequency, but were sometimes stollen from other ranks, particularly in Theatre organs. The percussive attack relates to the note being keyed partway though its cycle. In “subtractive” electronic organs this “key click” and is very difficult to filter out without serious degradation of the organ tone. The Baldwin organ used a resistive contact that took the sound from silence to the required volume very quickly with excellent results. Another technique was to pre-emphasise the upper harmonics so that you could filter the click and reduce the upper harmonics to the point where they were before pre-emphasis. The Hammond had a unique sound and was accepted for jazz largely because of its anti-traditional sound. But even then it was better accepted with the addition of a Lestie tone cabinet and was easily the best selling home organ of its time despite my obvious bias. I have to start off here by thanking you for putting so much time and effort and extensive detail into your Hammond organ portion of your website. I found this posting as well as your capacitor overhaul to be very informative as to how the electromechanical beast that is the Hammond organ gets it’s iconic sound. I am starting a project that I believe you may be able to help me on. I recently purchased a tonewheel generator off eBay much like the one you have rehabbed, but without the brains attached. It is my intention to create a hybrid tonewheel “organ” by using an Arduino to receive the signals of each of the tonewheel pickups and recreate the drawbar mechanism in some way. I would then use a tube preamp and see what kind of sounds I can make…it should be fun! I expect that I will be following your guide closely when it comes time to replace the capacitors on my generator. There are a few things I’d like to discuss with you. Would you mind if I go into more detail about this concept and get your feedback? You have my email if you’d prefer to take these questions offline. Thank you, and great job with all the work you’ve done!